Embarrassingly I admit that four years ago many of my attitudes were anti-family. Now don’t jump to conclusions I wasn’t an extremist. However I was at the point that I had given up on the ideal of marriage. I had seen so many horrible relationships and family breakups, that I had given into my naïve thoughts and decided that a good family was pointless and that there was no point trying. I turned into a skeptic questioning everyone’s happily ever after and anyone that strived for the ideal. Slowly I came to realize that the opposite of a broken family is not to avoid creating a family, rather it is a healthy stable family. Not only did I need to learn that, it is what our society needs a reminder of today. 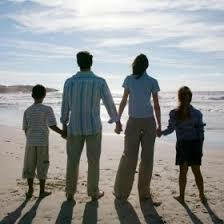 Families not only play a role in shaping individual lives but in shaping society and the stability of our nation. The family is the unit that connects the past, the present, and the future. This unit also has the greatest impact on how we will live our lives. However the importance of the natural family for both individuals and society is being lost in today’s policies and values. Threats to the nuclear family are becoming more prevalent. However these alternative family forms cannot provide the same stable environment. They are more prone to dissolution and unhealthy transitions. Cohabitation, single parent homes, homosexual marriage and childrearing, and divorce are all on the rise and are becoming more accepted by society. Cohabiting couples “rate of separation is five times that of married couples,” and children living in these unions are more likely to experience both physical and sexual abuse. Homosexual relationships have a higher rate of breakup and promiscuity. Divorce breaks up a child established environment and has lifelong consequences for the parents and the child. And research is still clear that the healthiest place for a child, both for physical safety and healthy development, remains an intact family structure with both biological parents in the home. The Witherspoon Institute in their publication Marriage and the Public Good: Ten Principles states “the clear preponderance of the evidence shows that intact, married families are superior—for adults and especially for children—to alternative family arrangements.” The traditional family brings mother, father, sister, and brother, together. The main focus is to unite all individuals in the system for the greatest good; however when we change the family structure we no longer focus on unity of the parts, but rather on the personal desires of individuals. Research shows that when families have unhealthy or extreme transitions, such as severe financial troubles or family dissolution, children are affected. They experience “toxic stress” due to the abrupt and constant adversity, which affects their development. The likelihood of these negative stressors and transitions increase in alternative family forms. Stable families provide many benefits to children, such as emotional health, academic performance, sense of identity, and safety. These benefits not only help the child to thrive, but are a benefit to society. We must keep in mind that “marriage is not simply a private relationship. It is a public and social institution that, when entered into as a life-long endeavor, generates an unappreciated level of human and social capital.” Families not only have an effect on those within them but also on those outside their boundaries. Our attitudes and behaviors on our own family structure will influence how others view marriage and family life, in general, and how culture defines the family. When we turn away from natural marriage in the slightest we are creating a less than ideal for society. “When marital breakdown or the failure to form marriages becomes widespread, society is harmed by a host of social pathologies, including increased poverty, mental illness, crime, illegal drug use, clinical depression, and suicide.” Family dissolution requires greater government involvement in our lives. This is seen in the legal system and welfare system. While married intact families help the economy and promote economic growth, these stable families help society by providing a source of permanence and stability for individuals to grow and develop. It links individuals together through social ties and expands resources actually increasing wealth. When we encourage alternative family forms we promote alternative lifestyle, ones which are not conducive to the development of a child nor the development of society. When we accept alternative family forms we by default accept the things that come with it; broken family ties, promiscuity, permanently motherless and fatherlessness, poor developmental outcomes, financial troubles, and a host of other negative outcomes. Not only do we accept them, we set them as comparable alternatives to the ideal. However change is possible in individual lives. I went through a dramatic change and know that it is possible for others, and if in individual lives then eventually in society as a whole. What we need to aim for is a return to stability. We can’t forget that there is an ideal, and this ideal creates stable home environments for children so that they can grow and contribute to a healthy society. We need to let our voices be heard as we vote and promote the healthiest family structure. Let people know that the ideal is still possible and aim for it in your own life.